Do Pimples on Your Head Cause Hair Loss? Ingrown hairs are a common condition that just about everybody experiences at one point in time. Some people tend to get ingrown hairs more often than other people, and this may very well have to do with a person's skin type or shaving method. 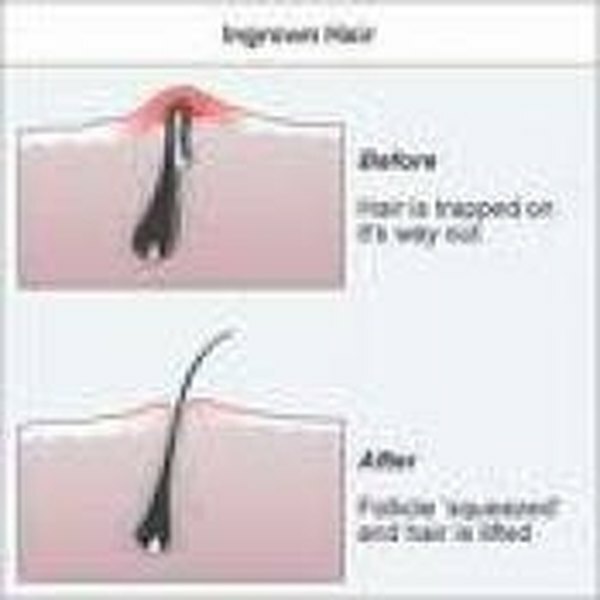 The most general solution to ingrown hairs, specifically those that turn into small, pimple-like bumps, is to loosen or remove the hair underneath by popping it. Then, prevent future ingrown hairs by exfoliating the skin often. Follow these simple steps to pop and relieve ingrown hairs. Apply a generous amount of exfoliating cream to a loofah and scrub the area where the ingrown hair is. This will likely break the ingrown hair bump open, freeing the hair inside. Exfoliating cream and loofahs can be found at most drug stores or in the health and beauty sections of larger stores, such as Wal-Mart or Target. Clean tweezers with rubbing alcohol and dry well. Squeeze the ingrown hair bump with the tweezers until it pops open. Pull out the hair with the tweezers. Apply a generous amount of witch hazel to a clean cotton swab or cotton ball and clean the affected area well. Apply a small amount, of antibiotic ointment, such as Neosporin or a generic brand. You will need just enough ointment to cover the affected area. Cover the area with a clean bandage. If you do not want to keep a bandage over the affected area, be sure to keep it clean and reapply antibiotic ointment as needed. Wash your hands thoroughly with liquid soap and warm water and cleanse the tweezers using rubbing alcohol. Doing so will help prevent the spread of infection. Try a warm compress to ease the pain or discomfort caused by an ingrown hair. Dampen a clean wash cloth with warm or hot water and apply to the ingrown hair. Repeat as necessary to relieve the pressure of the ingrown hair under the skin. Take extra precaution when popping an ingrown hair. If you tend to get infections easily, it may be best to contact a dermatologist and not create any situations where an infection can spread.